In any case, we got a pretty good response and signed up some new members. 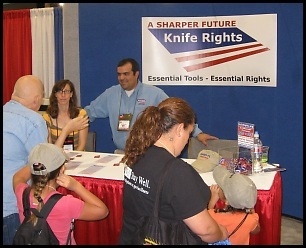 A special thanks to Pete Conway, Denise Brandenburg and Knife Rights board member Alan Romainia who helped staff the booth at NRA. Next stop is Blade Show in Atlanta. Come see us at booth 148 and win the Knife Rights Sebenza! Chris Reeve has generously donated a one-off custom Sebenza to Knife Rights to help us raise funds to support the organization and we will raffle this beautiful knife at Blade Show. This unique Sebenza is decorated with the Knife Rights logo and features a raindrop damascus blade ($615 retail value). Join or renew an annual membership ONLINE before May 28, 2009 and receive three chances to win! Click here for full information on the Knife Rights Sebenza Blade Show raffle. We thought we’d pass along some related good news. 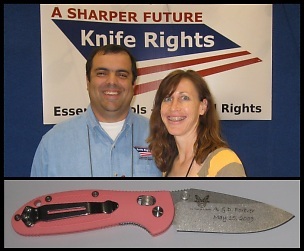 Knife Rights Board Member Alan Romania gave longtime girlfriend Denise a nice folder during the show in Friday and took it over to the Benchmade booth and had it laser engraved with her name. Pretty romantic by our standards, but, that was only the half of it. Late that night, after we’d all gone home from a nice dinner, he gave her an even more special gift, a diamond ring! About time, Alan! Next day at the show Denise had the reverse side of the Mini RSK Mk1 engraved as a memento of that special day. No question, she’s very special. We wish Alan and Denise the very best for their future together.